Megasealed are specialists in the non-destructive repair of leaking showers. Our ISO accredited sealing system is applied both over and underneath leaking tiles – targeting the underlying waterproof membrane to produce a full seal. This process is performed without removing or damaging your bathroom tiles or shower fittings. All Megasealed sealants are resistant to mould and wear and are available in a variety of colours to suit your bathroom decor. Our standard service is more cost-effective than a ’tiles removed’ solution. We stand by the quality of our repairs and offer a 25-year product warranty. Using a non-invasive electronic leak detector and thermal imaging camera, your Megasealed Franchisee or Technician will accurately diagnose the source of the leak (at participating franchisees only). Megasealed specialists will then degrout the shower perimeter, floor waste, wall- to-wall junctions and hob joints. Our Award-winning liquid membrane repair, called Megabloc, is then injected underneath the floor tiles to repair the waterproof membrane (at participating franchisees only). The grout is replaced with one of our exclusive 2 part epoxies – Megasealed or Megagrout Epoxy MG14. A sealant is also applied to the shower floor. Perimeter joints are sealed using our extremely flexible sealant, Megasealed Gold. 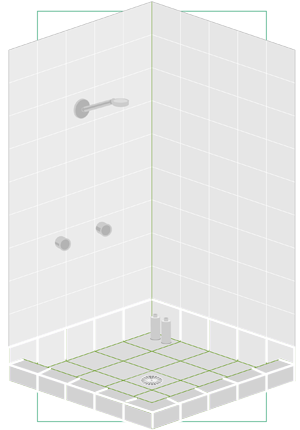 A penetrative sealant is then applied to the wall grout of the shower cubicle. The service is complete at this point – having taken only 3-4 hours. 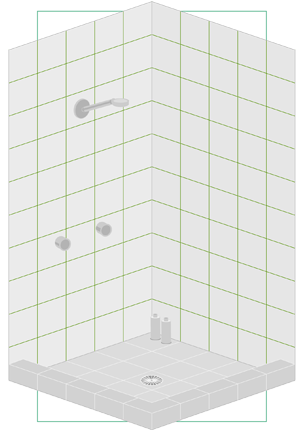 The shower is ready to use the next day. In some circumstances – whether due to customer preference or the extent of the damage – the ‘no tiles removed’ service may not be the most appropriate solution. In these cases, Megasealed can offer a complete and fully licenced shower waterproofing and tiling service. Service all tiled areas of your home: shower, bathroom, kitchen, or balcony. Need to re-tile on a budget? Megasealed offers a fast, convenient, no demolition tile-over-tile service. If necessary, a repair of the waterproof membrane can be carried out before the new layer of shower tiles is laid. Enjoy the benefits of a re-tile renovation – for less!